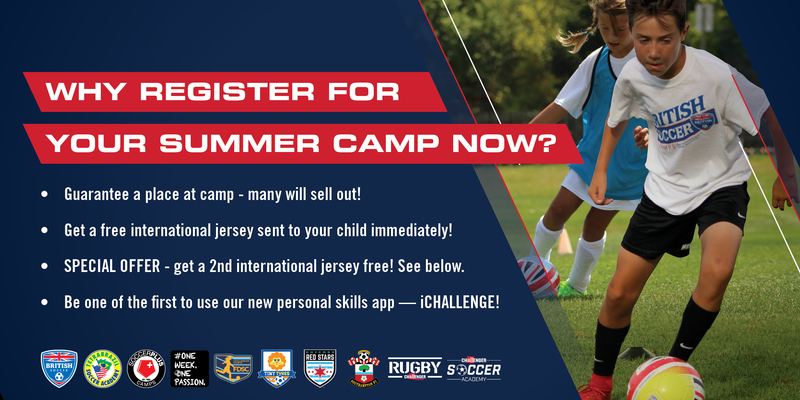 Don't forget to register for a summer camp during February and your child will receive 2 free international jerseys, plus a T-shirt and a ball! British Soccer Camps filling up in Arnprior this Summer! > CLICK HERE TO REGISTER<https://challenger.configio.com/ShoppingCart.aspx?com=productlist&txt=Arnprior&srch=t- Or to find out more! > Challenger’s international and domestic coaching staff will travel exclusively to work on these club programs. Each year hundreds of Challenger coaches have helped developed one of the most innovative approaches to coaching youth soccer camps in the US & CANADA. > Their energetic & enthusiastic staff study the game at all levels and are armed with a curriculum containing the key techniques and skills that your players need to work on and master to reach their true potential. > Each day includes individual foot skills, technical drills, tactical practices, coached scrimmages, and a daily World Cup tournament. In addition players will be treated to a rich cultural experience and lesson on respect, responsibility, integrity, leadership and sportsmanship. > Each child will also receive a free replica jersey (*plus shipping costs,for online registrations before May 26th &/Or June 16th) plus a ball, t-shirt, skills evaluation and FREE access to [http://www.thechallengerway.com<https://challengersports-dot-yamm-track.appspot.com/Redirect?ukey=1gj47JHDGTUojM0FyckNaeQuJyanK-iDWQPd6JiNNTuE-351662181&key=YAMMID-66009286&link=http%3A%2F%2Fwww.thechallengerway.com%2F]www.thechallengerway.com<https://challengersports-dot-yamm-track.appspot.com/Redirect?ukey=1gj47JHDGTUojM0FyckNaeQuJyanK-iDWQPd6JiNNTuE-351662181&key=YAMMID-66009286&link=http%3A%2F%2Fwww.thechallengerway.com%2F>.